In ancient China, it was believed that events in the sky directly reflected events on earth. If, for example, a comet suddenly appeared in the sky it was thought that something important and unexpected was about to happen on earth, perhaps something like a major battle. The emperor was believed to be the Son of Heaven who had been given the Mandate, or right to rule, by Heaven itself. It was vital that he could prove that he retained this right by predicting the movements of the sky accurately. His astronomers were therefore expected to watch the sky very carefully and they kept accurate records of the movements of the stars and planets, recording events such as Halley’s comet and various eclipses of the sun and moon. Halley’s comet appears in the sky every seventy to seventy-five years, so very few people see it more than once in their lifetime. Over time, Chinese astronomers recorded every instance of Halley’s comet from 3000 years ago, the only civilisation in the world to have done so. They also made drawings of how the comet looked each time. 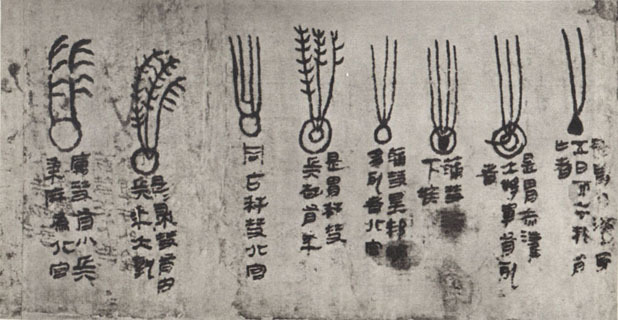 Source image taken from Album of Relics of Ancient Chinese Astronomy , Zhongguo Gudai Tianwen Wenwu Tuji, CASS (Chinese Academy of Social Sciences, Institute of Archaeology), 1980. Beijing. 8, 57. The emperor’s astronomers were also responsible for producing the calendar each year, a document commonly known as an almanac. No one else was allowed to calculate a calendar. It contained predictions of major events in the sky, which affirmed the emperor’s divine link to the heavens and ultimate power. Royal astronomers were in a difficult position. If they failed to predict an event like an eclipse then the emperor’s power might appear diminished and political rivals could take it as an opportunity to rebel. When dynasties fell, it was therefore believed that Heaven had directly intervened to give the responsibility of rule – or mandate - to a more worthy line. The job of royal astronomer therefore carried both huge responsibility for informing important political decisions, and severe penalties for mistakes. The Chinese sky was divided into five great regions or palaces called gong 宫. These were equated with the directions north, south, east and west and also with a middle region. The middle region was the most important as it housed among its stars the celestial image of the emperor surrounded by his family and civil and military officials. This part of the sky has constellations such as ‘the prince’, ‘the concubine’, and ‘the throne’ and is a reflection of life on earth. The rest of the sky contains the equatorial constellations grouped in the four directions, each associated with an animal and a colour. In addition, Chinese astronomers identified twenty-eight segments in the sky known as mansions or lunar lodges and called xiu 宿 in Chinese. The exact origin of the mansions is not known. It is possible that they once marked coordinates through which the moon passed during its monthly journey around Earth and served as a way of tracking the its progress. However, later the mansions were used rather to measure the coordinates of celestial bodies along the equator in the Chinese system. Many of the most important Chinese constellations are situated within these twenty-eight mansions. The Chinese tradition of associating animals with the four points of the compass has a long history. The animals of the four directions are first mentioned in an ancient Chinese manual of divination, The Book of Changes (Yijing 易经). 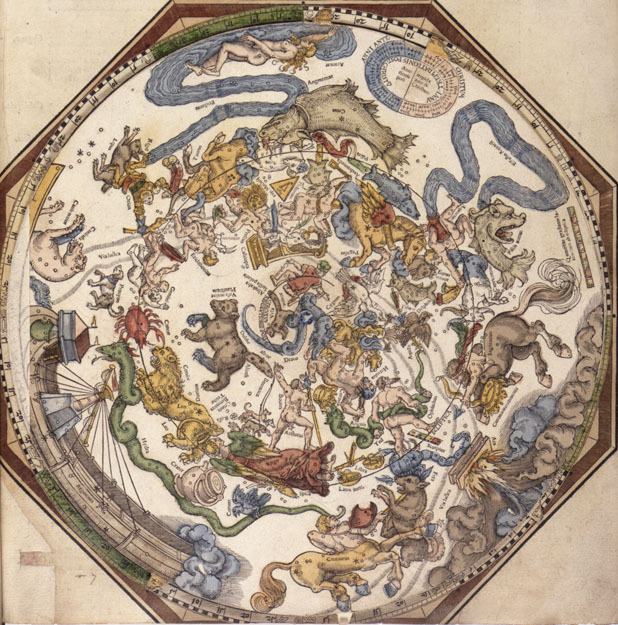 Here, a map of the heavens, Sifang 四方, shows mystical animals holding court over not only the directions of the earth, but also over the seasons of the year. The Black Tortoise, Xuan wu (玄武), represents both north and the winter; A symbol of longevity, the tortoise of the north is often depicted together with a snake. The union of these two creatures was thought to have created the earth. It is also associated with the element water. The Blue Dragon, Qing long (青龙), represents both east and the spring; Unlike in western mythology, the dragon is rarely depicted as a malevolent force but generally considered to be both benevolent and auspicious. It is also often associated with the emperor and therefore linked to the Red Bird, whose own association is with the empress. The dragon is associated with the element wood. The Red Bird, Zhu que, (朱雀) represents the south and the summer; The bird is sometimes seen as a phoenix and associated with good fortune. It is also often paired with the dragon. It is associated with the element fire. The White Tiger, Bai hu, (白虎) represents the west and the autumn; The tiger is often seen as a protector and was thought to guard over the armies of the emperor and protect the spirits of the dead. It is associated with the element metal. Look at the images of the Chinese sky above. Having read about which animal represents which direction, you may have noticed that the directions east and west (on the left and right of this chart) appear to be on opposite sides to those you might have expected, or seen on land maps. Can you explain why this might be the case? This chart is a flat picture of the sky above your head. You might think that east and west seem to be on the wrong sides of the chart, but they are not. If you hold the chart above your head, with north and south pointing the right way, then east and west will be on the correct sides — try it! An astronomical star chart, like this one, shows us how stars are seen when we look up into the sky. Charts and maps in the west are normally oriented with north at the top and east to the right. In China, land and star maps are oriented with the north at the bottom and therefore east to the left. Therefore this chart shows the view you would have if you were looking up at the sky and facing towards constellations in the south. 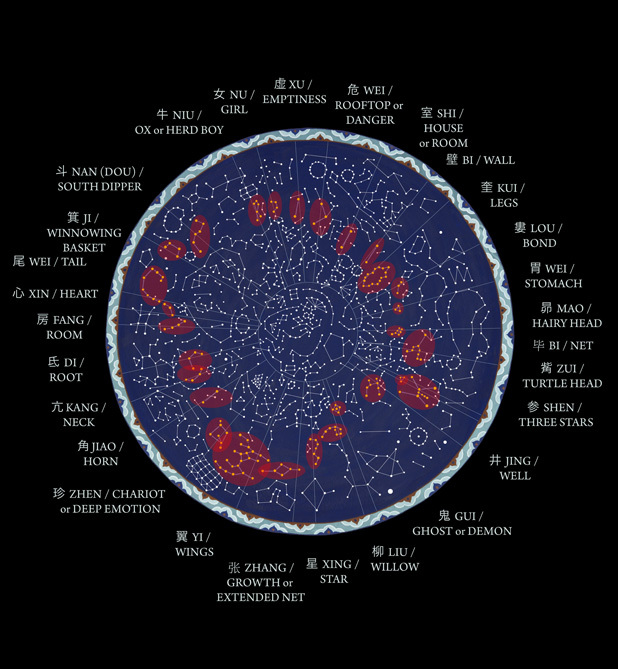 Looking at the map of the sky in the section above, we can see how the Chinese constellations are grouped into four directions, and also fall within one of the twenty-eight segmental divisions known as ‘mansions’ or lunar lodges. The most important Chinese constellations are situated very approximately along the celestial equator within the twenty-eight mansions and are seen highlighted in yellow. Although some of these constellations correlate loosely in appearance to groupings recognised in Europe, largely the patterns are quite different, as comparison with these western star maps will show. Apian's Star Chart from Astronomicon Caesareum , 1540. 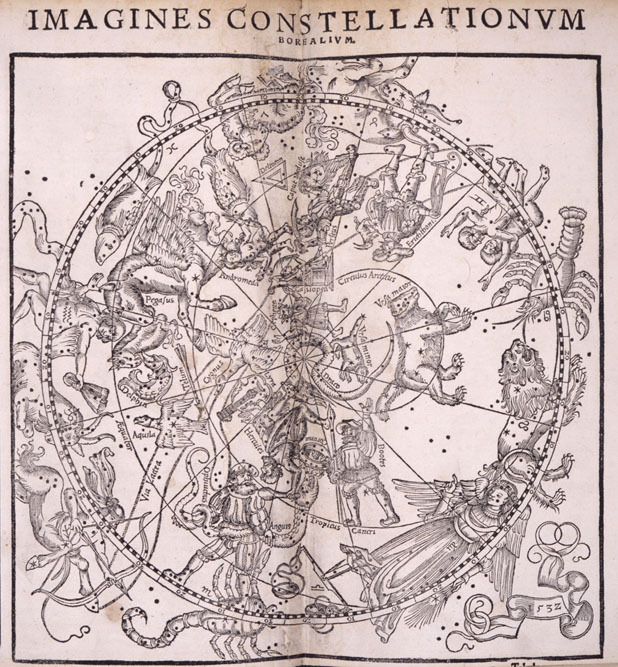 Honter's Star Charts , 1541. 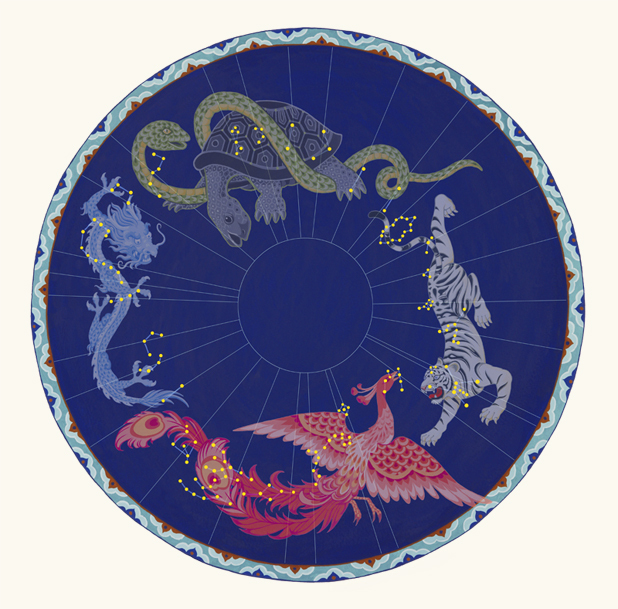 The twenty-eight constellations of the Chinese sky are also important for astrological divination and have various linked meanings and associations. The first is the name of a famous general. According to legend, a terrible battle once broke out between two warring kingdoms. Twenty-eight great warriors came to the aid of the general. Although they were defeated, their names were given as a mark of respect to the heavenly constellations. Each constellation is also associated with an animal, and also with a particular day of the lunar cycle. It is believed that when the moon moves through these constellations on their designated days, fortunes relating to auspicious and inauspicious activities for the day should be observed. These associations are well documented in popular Chinese books and help advise people which days will prove the best for important plans such as marriage, burial, the watering of crops or the building of houses. Take a look at the following image and the table below to identify the twenty eight circumpolar constellations and learn more about their associations and meanings. Familiarise yourself with these twenty-eight constellations by making your own star-finder. Visit the Classroom Ideas and Activities page to download a template and instructions. 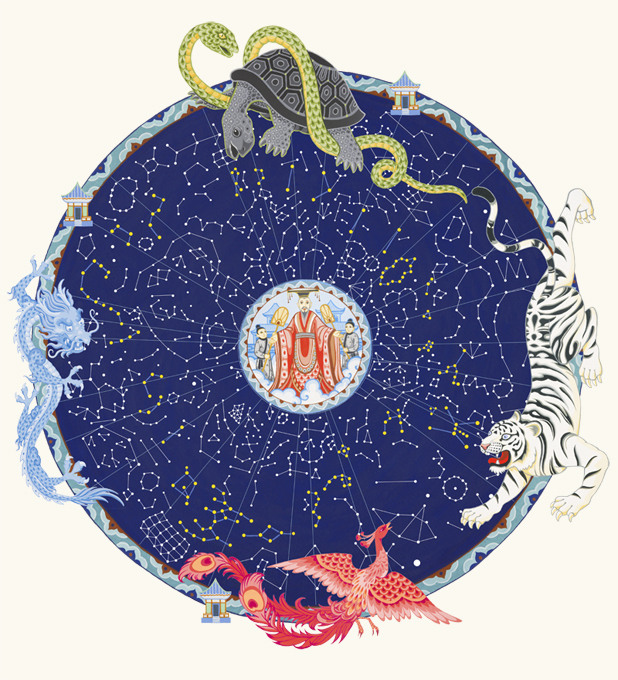 You can also download a free wallchart illustrating the Chinese sky and all the constellations. Because one of the main purposes of astronomical observation in ancient China was timekeeping, the sun and moon were very important. The Chinese used a calendar system based on the phases of the moon (measured through observing the position of the stars in the twenty-eight mansions) and the time of the solar year, or season. The superstitious belief that linked events on earth to those in the heavens made people very wary of events in the sky. Solar eclipses in particular were regarded with fear, and a common belief was that these occurred because a great dragon was attempting to devour the sun. The forewarning of such an event was therefore imperative so people could gather to shout, strike gongs, and scare away the dragon. Over generations of observation, astronomers discovered a relationship we now know as the Saros cycle, a cycle in which sun, moon and earth are aligned in a particular way approximately every 18 years, 11.3 days. This enabled them to predict solar and lunar eclipses with some accuracy but it was not an infallible system. In 2136 BC there was an unpredicted eclipse. Documentation about this event dates it as the earliest recorded eclipse in history but it also tells us about the fate of the court astronomers Xi 羲 and He 和 who failed to predict it in advance. Given the belief that such celestial events reflected events on earth and should be predicted by the emperor, complete accuracy was expected of court astronomers, and failure meant only one fate – execution. The sun and moon have always had a special significance in Chinese folklore and various symbolism and myths surround them. The mid-Autumn, or Moon Festival is perhaps the second most important traditional festival in China after Chinese New Year. It is held on the fifteenth day of the eighth lunar month when the moon is said to be at its largest, roundest, and brightest of the year. The shape of the moon is said to represent completeness and perfection and its celebration is an important family occasion each year. Special round cakes, called moon cakes, are made to eat during the festival. 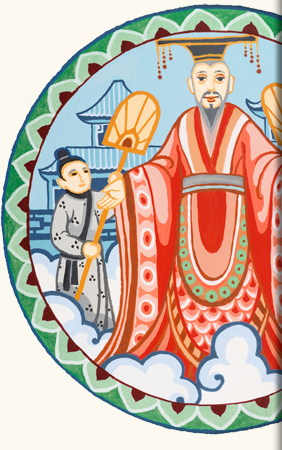 The sun and moon have developed a particular iconography in China. 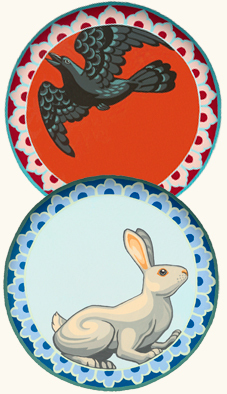 The red sun is often pictured with a three-legged crow and the moon features a white hare or rabbit, pounding a pestle and mortar. The association of the hare and the moon is common to folklore all over the world. One Buddhist jataka – stories about the Buddha in his earlier lives – tells that he was once a hare and sacrificed himself to the god Indra who was suffering from hunger. As thanks for his selflessness, Indra then immortalised the hare by placing his image on the moon for all to see. Another story tells of a white hare serving Chang E 嫦娥, the Queen of the moon. There are several versions of this myth that may explain the origin of these motifs. Visit our myths page to learn more about these myths and other legends relating to the sky.